Over 250,000 people have taken Veganuary’s dietary pledge in 193 countries since 2014 and it is expected that another 300,000 people would take the pledge by the end of January 2019. Building on the growing global interest in veganism, Veganuary is this year partnering with dynamic environmental and animal protection groups in India, Singapore, Japan, Malaysia, Australia, Brazil, Russia and South Africa to offer the full, locally-tailored Veganuary experience to people signing up for a 31-day vegan pledge in those countries, in their native language. “We’re expecting a major response in at least 15 cities and measurable reach in at least 10 more. Every City Lead is going to customise the campaign according to their communities and bandwidths. It’s going to be a festival of sorts with events, entertainment, promotions, contests and prizes,” said Dharmesh Mehta, cofounder of Earthr.org and Country Lead for Veganuary India 2019.
Who are the City Leads? More cities are joining every week, and the national team is already in talks with Dehradun, Chennai, Jalandhar, Indore, Siliguri, Nagpur, Ratlam, and Guwahati. This year’s Veganuary (UK) campaign includes a call on the UK Parliament to ditch meat and dairy for January. The Government has so far done little to heed the advice of the scientific community, which states that reducing meat and dairy consumption is vital if we are to avert catastrophic climate change. While the public appetite for everything vegan continues to skyrocket, this has not been matched by policy or political leadership. Claire Perry MP, the minister whose job it is to tackle climate change, refused to recommend that people reduce their consumption of meals like steak and chips. 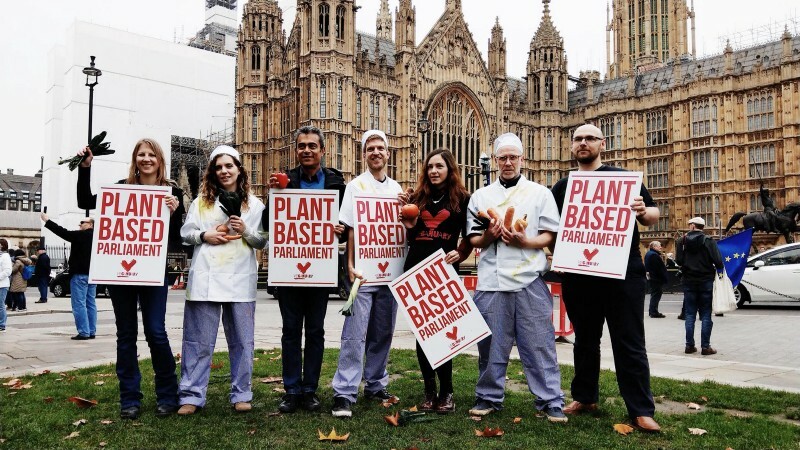 With the help of spirulina-soaked chefs and supported by vegan MP Kerry McCarthy, the Veganuary (UK) team is calling on Parliament to try vegan this January. “Trying vegan for January by switching to tasty plant-based alternatives in the cafeterias of Parliament would be a simple step to take for our leaders to lead by example and show they’re serious about tackling climate change”, said Rich Hardy, Head of Campaigns at Veganuary. People take a pledge to go vegan from January 1 through 31, following which they receive inspiration and information in the form of recipes, myths, facts, meal plans, inspirational videos, communities around them, accessible and affordable food brands, and vegan eateries around them. They also receive thought-provoking information about the impact of what we eat on our health, animals and the environment. Along with the email campaign, teams would also make use of social media and offline activities. And if that’s not enough, the Veganuary website – the world’s largest online resource for vegan pledgers – will be crammed full of exciting new content, including films from our supporters in show-business, professional sport and the culinary world. An India-specific version for Veganuary would be hosted at earthr.org/veganaury. Earthr.org is an India-based global non-profit foundation that brings sustainability problems, solutions, entrepreneurs and investments together on one platform through crowdsourcing. In a short span of time, more than a 100 users have contributed over 350 solutions to tackle problems like climate change, food waste, inequalities, among others. Earthr.org strongly believes in the power of crowdsourcing which has brought about the likes Wikipedia, Linux, and Blockchain. If you have a vegan business, product or service, we are looking for you. We’re also looking for supporters, influencers, celebrities and media people who believe in a healthy, cruelty-free and sustainable world. Partner with us for Veganuary India 2019. Reach out to Dharmesh Mehta at dm@earthr.org. Sponsored in part by VegFund. Join the Veganuary India Facebook Group.